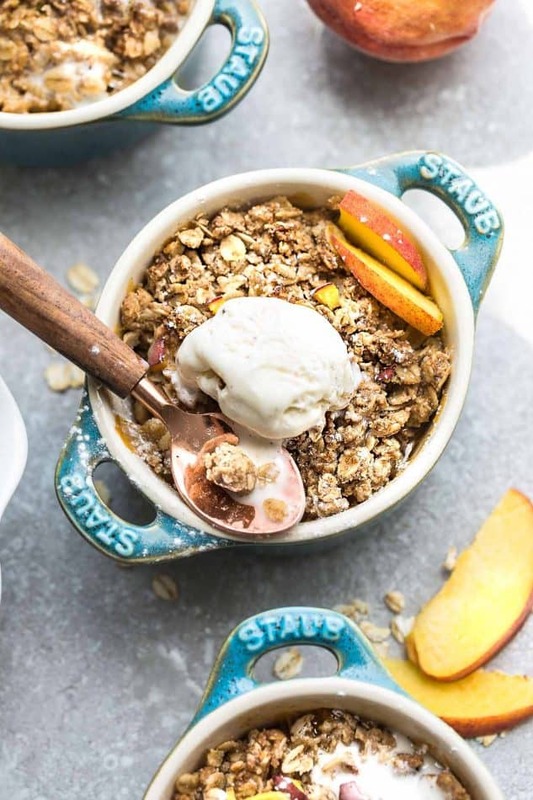 Peach Crisp – an easy summer recipe full of juicy peaches and a thick cinnamon oat crumb topping. Best of all, this classic dessert is gluten free, butter free and has less added sugar. Although summer is slowly winding down, I am still not quite ready to let go of fresh summer fruit. I am a big fan of fruity crisps. It’s seriously one of the easiest things to make — and probably one of the few desserts I’m willing to turn on the oven for when it’s super hot outside. What I love about crisps is that you can use any combination of your favorite fruits. Just add a crumbly cinnamon oat topping on top, and then let it bake to crispy perfection. This Easy Peach Crisp is such a great way to use up those juicy summery peaches, but it’s less in added sugar. I swapped out regular sugar with SPLENDA® Naturals Stevia Sweetener. It’s made with a cleaner-tasting part of the stevia leaf and provides the same sweetness as two teaspoons of sugar but with no calories. And instead of butter, this peach crisp is made with coconut oil and is also completely gluten-free. Arrowroot starch (or corn starch) helps to thicken up the filling so it holds together when you’re serving it. 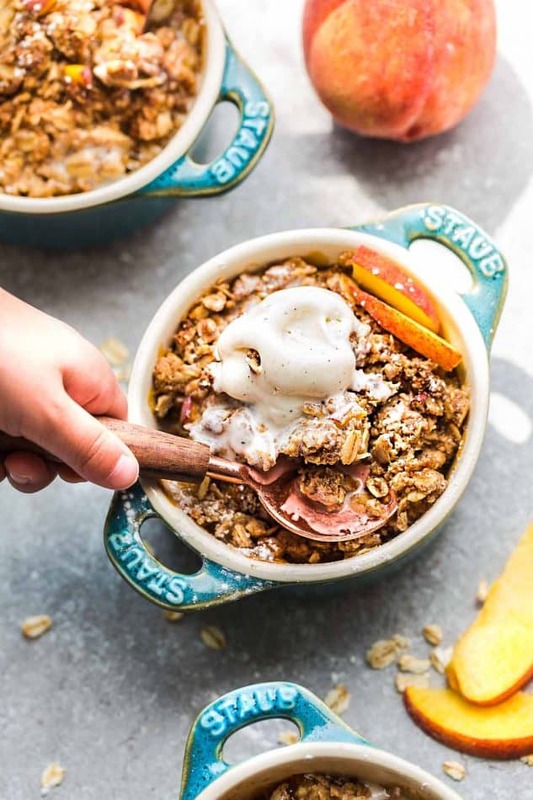 The cinnamon oat crumble on top of this peach crisp is also insanely delicious. It bakes up all beautiful, golden and crispy, and is the perfect contrast to the sweet, juicy, warm peaches. Also, the mini serving portions makes this perfect for sharing with guests. 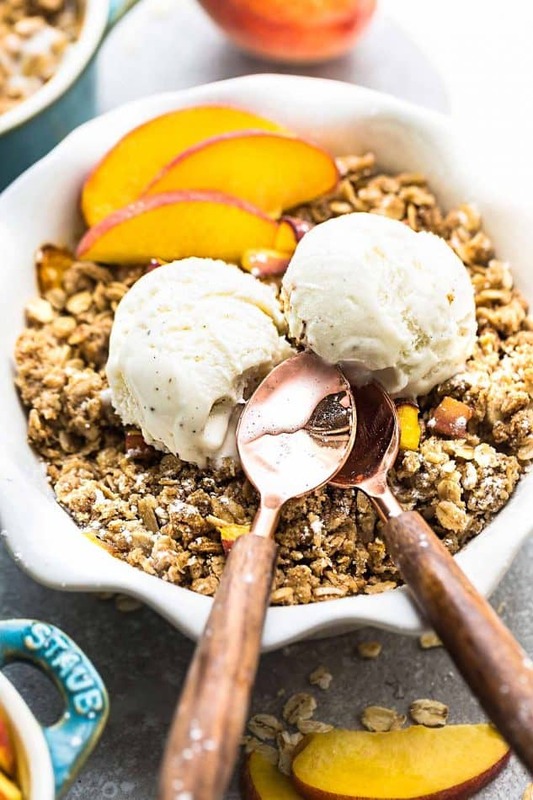 Enjoy this peach crisp on its own or with a scoop of frozen yogurt or vanilla ice cream. Either way you choose, it’s the perfect way to celebrate the last few weeks of summer! To prepare the filling: In a large mixing bowl, toss together the peaches, sweetener, arrowroot starch, vanilla extract and cinnamon until thoroughly combined. Divide evenly into ramekins or spread into baking pan. To prepare the topping: Wipe down the same mixing bowl and toss in the oats, oat flour, sweetener, cinnamon and salt. Add coconut oil and use your fingers to combine mixture until it's moist and crumbly. Bake in preheated oven for about 35-45 minutes, or until the filling is bubbling around the edges and the top is lightly golden.